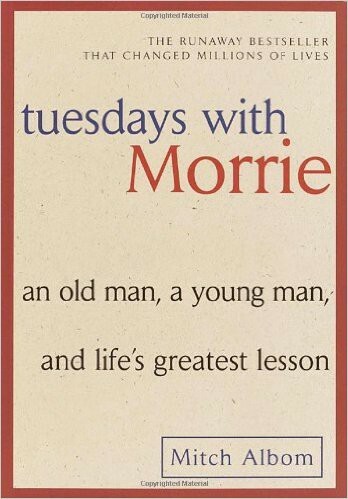 Tuesdays with Morrie is written like a fictionally story, eloquently told. Yet, it is actually a true story, a non-fiction book, written by Mitch Albom. It is some life lessons taught to Mitch Albom, by his dying sociology professor. The most important thing in life is to learn how to give out love, and to let it come it. Our culture does not encourage thinking about life, until you are about to die. Do what Buddist do. Every morning, imagine a bird on your shoulder. Ask the bird: Am I going to die today? The truth is.. if you ask the bird, then you might not be as ambitious as you today. Whenever people ask me about having children or not, I never tell them what to do. I simply say, ‘There is no experience like having children.” There is no substitue for it. You cannot do it with a friend, or a lover. If you want the experience of having complete responsibility for another human being, and to learn how to love and bond in the deepest way, then you should have children. If you hold back on the emotions — if you don’t allow yourself to go all the way through them — you can never get to being detached, you’re too busy being afraid. We all have the same beginning — birth — and we all have the same end — death. So how different can we be? Invest in human family. Invest in people. Build a little community of those you love and who love you. Death ends a life, not a relationship. You live on — in the hearts of everyone you have touched and nurtured while you were here. All the love and memories live on. When asked to describe his “Perfect Day”, he described a very average day. After all these months, lying there, unable to move a leg or a foot — how could he find perfection in such an average day? Then I realized this was the whole point.